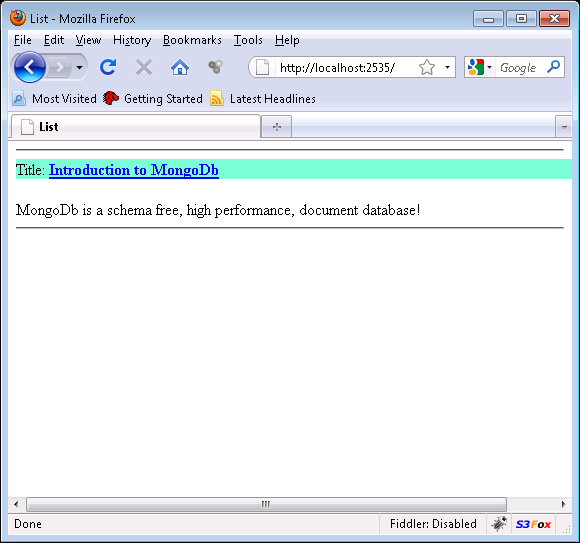 MongoDb is a schema free, scalable, high performance document database. In this article we will demonstrate how quickly you can make a blog using ASP.NET MVC Framework, MongoDb and the C# driver. This article does not focus on creating the blog theme, logo or design. 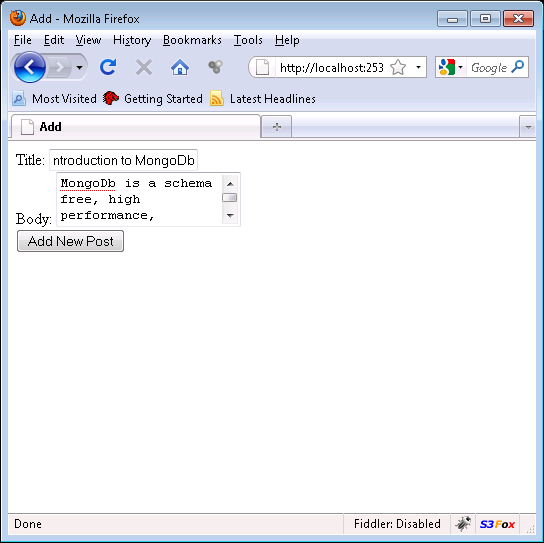 The article shows how to use ASP.NET MVC with MongoDb to quickly setup a blog engine. In other words do not expect any pretty layout and design for the blog. The real beauty of MongoDb database is that it is schema independent. We will develop our schema as we progress in our application. The idea of being schema independent also forces us to focus on the domain. And we all know that domain is the heart of an application. Our first task is to create the blog database. Since this step must be performed only once per application we placed it under the Application_Start event inside the Global.asax file. Invoking CreateBlogDatabase multiple times will not override the database but returns the database if it already exists or create a new database if it does not exists. We will first focus on adding posts to our blog. This way it will be much easier to show a list of posts. 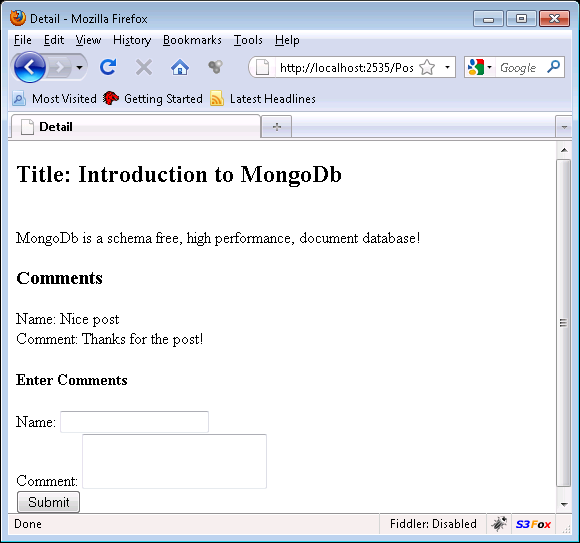 The _postRepository.Save method is responsible for persisting the post to the MongoDb database. Nothing complicated in the above code! We are simply inserting the post into the posts collection using the Insert method and then disconnecting from the MongoDb server. 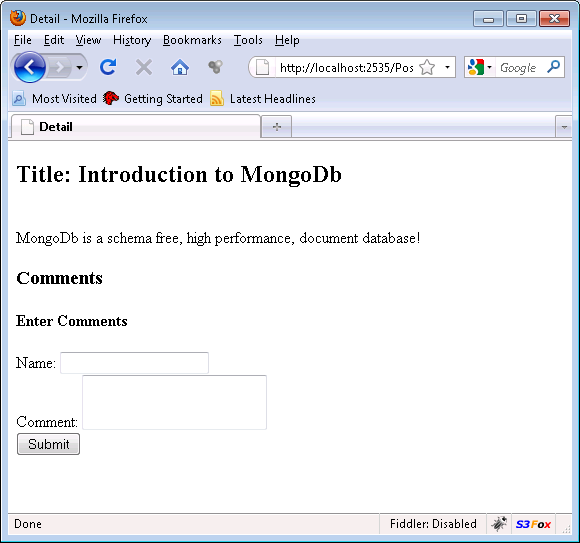 The document is searched by using the "_id" key which is the unique document ID created by MongoDb for each document stored in the MongoDb database. The first thing to notice is that we are iterating through the Comments collection for our post object. If we find any comments attached to that post we display them. The Detail view also provide the user with "Name" and "Text" input fields which can be used to insert a new comment. The "AddComment" action is invoked when the form is submitted. The "Name", "Text" and the postId is transferred to the "AddComment" action in the PostController. We first retrieve the Post by using the parameter postId. After getting the post we use the AddComment method to attach a comment to the post. Finally, the _postRepository.Update is fired which updates the post with comments. In this article we learned how easy it is to integrate MongoDb with ASP.NET MVC framework and build a comment enabled blog in few minutes. MongoDb helps us to focus on the Domain of the application. And since it is schema free our domain expands automatically as the application develops.